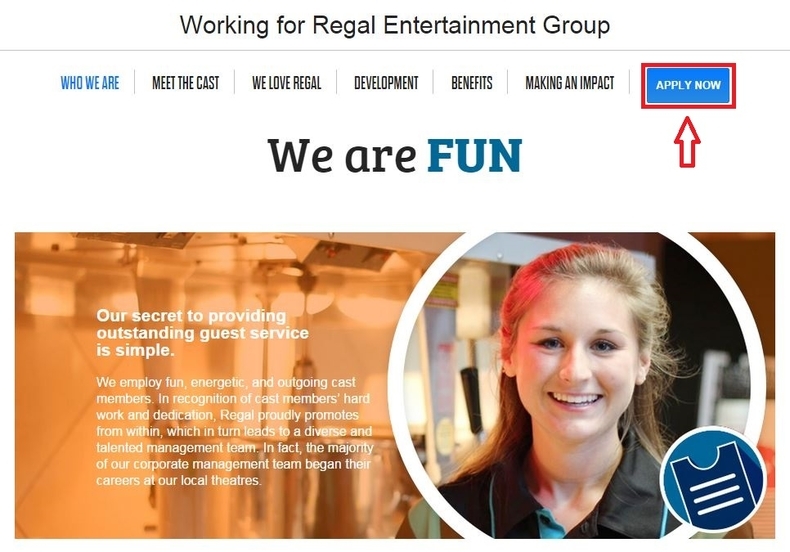 Visit regmovies.com/careers or regmovies.com/jobs and you will land on Regal Cinemas Careers page. 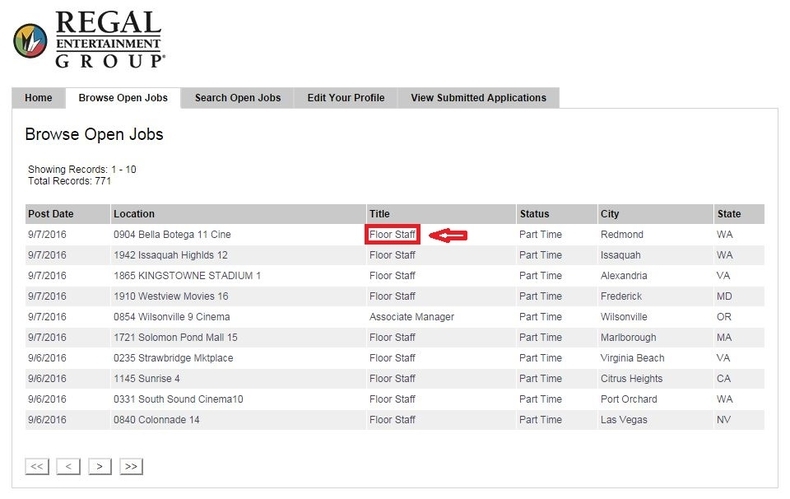 You can click the button "APPLY NOW" to search job opportunities after you get well known about careers at Regal Cinemas. Enter your search criteria like city, state, postal code etc. and click "Submit" to search open jobs. You can also click "Browse Open Jobs" to view all the job openings. 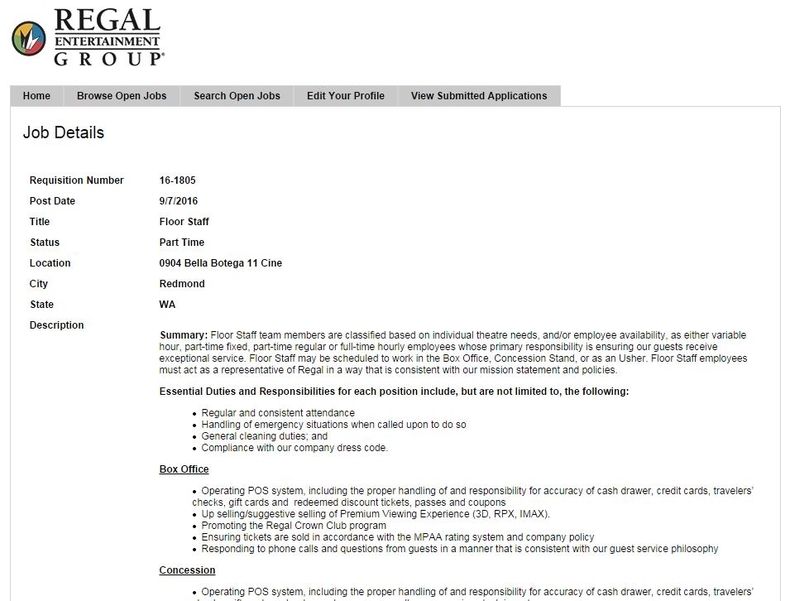 Here we choose to view all open jobs. Browse the job openings list and select the one you are interested in. You can click the post date, location, title, status, city or state of any position to know more information. To set you an example, here we just click to view the details of the first position displayed on the list. View the details of the position like description, requirements and then click "Apply On-line" at the bottom of the page to start your application. Read the job details carefully and think about if you can match the requirements of the position. If you are qualified to apply for the position you are interested in, please don't hesitated to click the link down below the page. Login with your account or click the link to create a new account. Enter your email address and password to login to the career site if you have previously created a profile. If you are a first time user, just click the link and follow instructions to create a new account. Choose your resume file to upload. 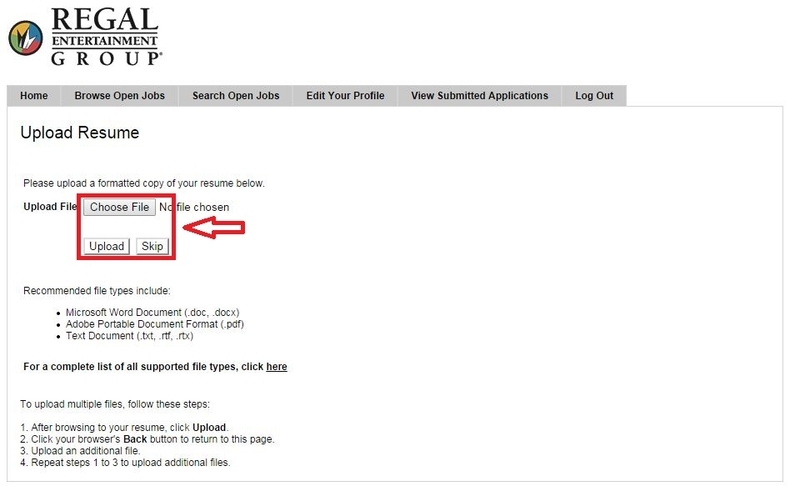 If you do not have a resume to upload, you can click the button to skip this step. Here we just skip this step and continue with the online application. You'd better proceed your application on computer rather than use a smartphone or tablet. For using a smartphone or tablet, your application may not be available for review. Follow instructions to answer the given questions or provide required information and then click the button "Next" to continue. You need to answer some general questions, provide information regarding your education, employment history, professional references and leave your signature. Please notice that the fields marked with asterisk are required to finish. You need to finish all the required fields on each page about click the Next button to move on to the next step. Finish the final step by indicating how you hear about this position and then click the Next button to submit your application. After you successfully submit your application, you will be directed to a page where you can see the Thank You notification which indicates that your application has been received. 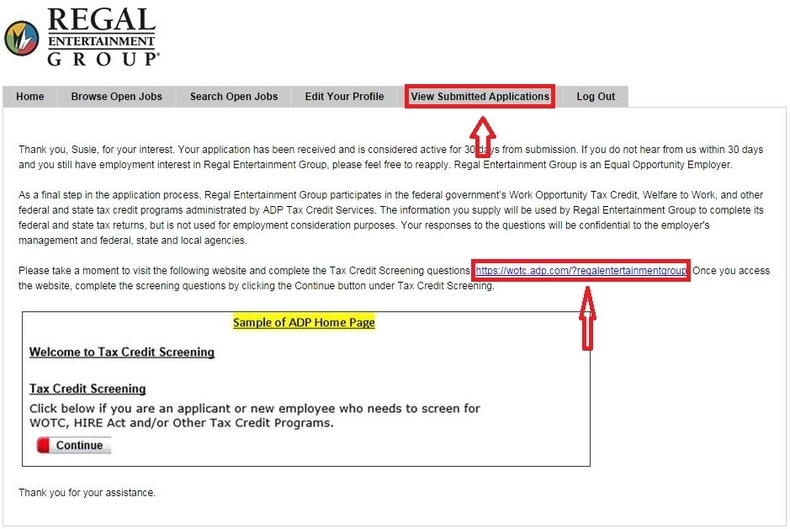 You can click the link to complete the Tax Credit Screening questions or view your submitted application. 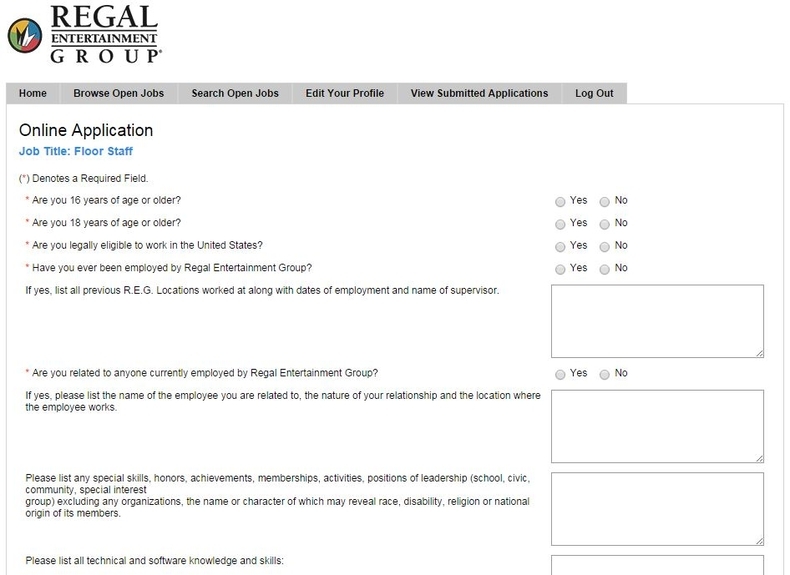 Click regmovies.com/careers to apply for Regal Cinemas jobs online.